Seichi Tabata sensei and Emiko Tabata sensei had a long close relationship to the Orange County Ki Society. From 1970 when their son, Calvin Tabata sensei, started the Lewis and Clark College Aikido Club, they visited often to teach, lecture and set an example of living Ki Principles in daily life that left a strong impression on the club, which included John Gilmore. When our non-profit organization was formed in 1974, the senior Tabata senseis continued to support and boost the development of our membership and instructors over the decades by teaching us, hosting us in Honolulu many times for Koichi Tohei Seminars and other training events. Seichi Tabata sensei and Emiko Tabata sensei were strong but kind mentors to John Gilmore over many decades and helped him develop professionally and personally as well as in training. Through it all their generous spirits and confidence in Ki and Ki Principles continues to have a profound and lasting impact. We treasure our time with Seichi Tabata sensei and Emiko Tabata sensei and the lessons they taught us. Seichi Tabata sensei was born in Lahaina, Maui on July 31, 1926, the third child of Shozo and Mitsuru Tabata. He was born a healthy child, but after contracting measles at age three, he became very ill and developed asthma. Due to his asthma, he was only able to attend school half the time. At age nine, his father sent him to learn Judo to build up his frail, weak body, in addition to his confidence. With training, he became healthier. He continued training in Judo and at age 18 volunteered in the Army. After taking basic training at Scholfield Barracks, he left for Japan and was stationed at Camp Zama and later in Osaka. After one and a half years, he was made Staff Sergeant. In Japan, he met and married Emiko Tabata, his devoted and nurturing wife for over 60 years. In 1948 and he left the Army and returned home to Maui, to work with his father at the Tabata Store. Tabata sensei received his 3rd Dan in Judo and started teaching Judo in Lahaina, Maui. The Captain of the Police Department asked him to teach the children of Lahaina, because he was having problems with burglaries and thefts in the area. Tabata sensei had about a hundred Judo boys that were a band of “Rascals.” Their behavior improved with his teachings and they are now doing well wherever they go. Tabata sensei met Koichi Tohei sensei in 1953 after his father told him he read about a man from Japan who was very strong and powerful. Although he was only 5'3" tall and weighed 145 pounds, he could throw a man with one finger. Tabata sensei went to observe Tohei sensei's exhibition in Honolulu and was asked by Tohei sensei to participate. Tabata sensei was so impressed, he asked Tohei sensei to come to Lahaina, Maui to teach. Tohei sensei went to Maui, and returned to Hawaii the following year to teach and established dojos across the islands. 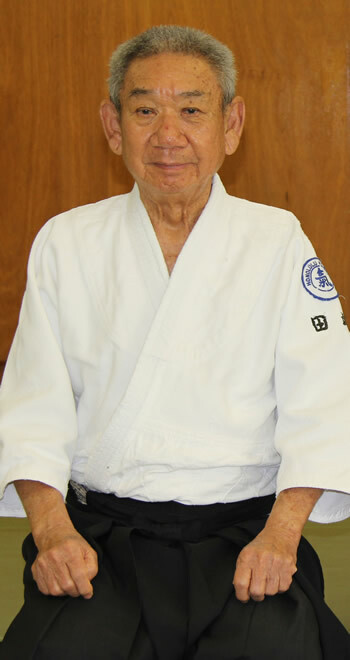 Tabata sensei became one of his first students in Hawaii and his devoted student for nearly 60 years. In 1961, Tabata sensei moved his family to Honolulu. He worked as a stock clerk at Foodland but the pay was too small to support his family of five. So he started working for the retail chain Household Devilles and was made president the following year. In 1975, he went to work as a salesman for American Mutual Company, and after six years, transferred to Occidental Underwriters to sell insurance. He became a member of the Million Dollar Round Table for twenty years. Tabata sensei worked very hard all his life to provide the best for his family. He always believed in being positive and reached all the goals he set for himself. Tabata sensei will be deeply missed. May all whose heart he touched, carry on his legacy of helping others through the principles of Ki and Aikido. In loving memory of Mrs. Emiko Tabata.